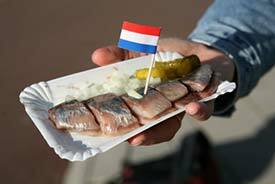 ABOVE: Street food for herring fanciers. INSET BELOW: Frites with mayonnaise. These reviews of quality restaurants include photos, prices, and maps. The guidebook publisher offers mini-reviews of restaurants. If you wish, you can sort the list by cuisine, price, or user ratings. Our illustrated article describes a dinner aboard "The Pancake Boat" in Rotterdam, but it also has information on Amsterdam's Pannenkoeken Boot.